In 2014 I was invited to attend a four-day Transcendental Meditation training. This invitation came at the perfect time on my spiritual path. By this point on my journey I was heavily involved in the practices of Kundalini meditation and I was taking myself through another round of the daily meditations from A Course in Miracles. Though I felt spiritually fulfilled, I was curious and interested in expanding my spiritual repertoire. Throughout my life I had heard a lot about Transcendental Meditation (TM). I had read about the great health benefits and energy shifts TM offered. I was curious and open. That summer I was living at the beach and I knew that the TM teachers from the David Lynch Foundation were training people in a beach house nearby. I asked about the training but was told it was full. Then one day out of blue I got a text from my friend Michael. I was blown away by this Universal hook-up and immediately replied “YES!” to Michael’s text. After a short four-day training I was given the gift of Transcendental Meditation. Transcendental Meditation is a simple meditation practice where you sit for 20 minutes twice a day and recite a unique mantra. This mantra is given to you by your teacher. The coolest thing about having a mantra is that it’s only for you! Transcendental Meditation allows your body to settle into a state of deep rest and relaxation and clears space for your mind to reach a state of inner peace. A study published in the journal Circulation found that practicing Transcendental Meditation lowers blood pressure and your risk for heart attack and stroke. It could also cut your risk for Alzheimer’s disease by strengthening the communication between different parts of your brain. Other studies have shown that TM reduces stress, blood pressure, anxiety, depression and anger. The greatest study of all is the one I performed on myself. Through my daily TM practice I have found a new freedom and peace. I feel more at ease, less irrational and more connected to the flow of the Universe. TM has greatly benefited my relationships, especially my connection to my husband. We practice TM together and feel a deep connection we hadn’t known before. TM helps us stay compassionate, loving and understanding toward one another. If you want to learn more about TM, a great book on the practice and the countless studies proving its benefits is Transcendence by Dr. Norman Rosenthal, a researcher and psychiatrist. If you want get trained in TM, check out the David Lynch Foundation. In the video below I introduce you to my dear friend and the CEO of the David Lynch Foundation, Bob Roth. The David Lynch Foundation has been dedicated to bringing TM to the masses since 2005. The foundation trained me and I am eternally grateful for their support and guidance. Watch this video for more information on TM and experience the love and light of my friend Bob Roth. Thank you for this video Gabby and David. I had a miscarriage last week and I feel really lost since then. I was praying and asking for guidance when I saw this video. I know how a group meditation can be powerful because I used to go to a meditation center where we meditated for 1h30 about peace and it really made me feel love for myself and the world. I would like to know how to choose a mantra ? Thank you both for dedicating your life to peace, it’s really beautiful. Noemie, you’re in my thoughts and prayers as you work through this difficult time. 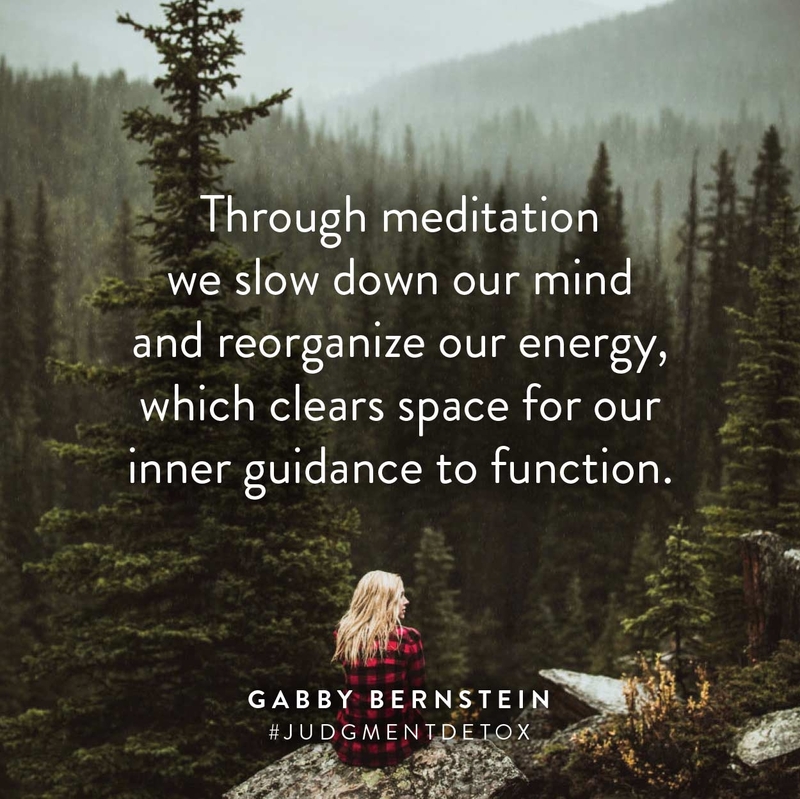 Gabby has so many great meditations at http://gabbyb.tv/tag/free-guided-meditations. I also love this mantra, sung by Snatam Kaur, when feeling stuck or grieving: https://www.youtube.com/watch?v=mtpB2AE8vEM. You’ll find the mantra and meaning in the video description. I want to go to Meditation University! Seriously….. YES! I think that Maharishi University is an amazing school. It’s about developing higher states of consciousness as part of receiving a high quality higher education. The graduate education I received there in Education was the most enjoyable, fulfilling, growth producing educational experience I have ever had. Hi Noemie, condolences on your loss. I hope that you find peace and recover for the heartbreak. In love and light. I know a coach who specializes in helping couples and individuals heal after a miscarriage. I’d really love to connect you with her if that serves you. Lots of prayers and all the best. I love that you are continuously learning and are still a student of spirituality. You are truly an inspiration to me, even though you could be my daughter! Love and Peace to you ??????? Wooooooowwwww so gonna write him :)))) Thank you so much, Gabby. <3 <3 <3 You're both so wonderful!! As a clinical Psychologist (and Meditation-Lover for that matter 😉 ) I am now super excited & motivated to learn more about this! Sending Love & Light and wishing everyone a great week ahead! Great video Gabby! So interesting. I have been building a meditation practice just a few minutes every day and it is so helpful. I would love to try this practice- if I can work myself up to it. Hi Gabby! I absolutely love this! Went to the sight but I am unable to see anywhere how to get the training. Please help! If you go to http://www.tm.org/, you can find a certified teacher nearest to you that offers the TM course of instruction. Did the TM course last year. Its amazing and now a part of my life. Bob Roth is amazing as is Lynch. My hope is that one day it is a wide spread practice in Africa. This continent needs it ASAP. Light and Love ???? Hope may be lightyears closer than you realize. I say this because I once did a one-day course when I struggled with severe depression and I felt positively more unwell at the end of the day. However, if this isn’t the case for you, then all the best!!! Hey Spirit Junkies! So THANKFUL I found this video. I’ve been so intrigued by how we can take the principles of meditation and spirituality and apply it to the global conflicts that are plaguing our world. This video is wonderful. Where can I learn more about these “Peace Universities”?? Meditation is the best free medicine. I used to meditate and then fell off. Lately, I crave it and have set the intention to start again. I started last night. It’s the only thing that I know that can calm my mind as I have way too much noise. This is a wonderful video and prescription for anyone looking to replace a bad thing with a good thing. Awesome stuff Gabby! I myself took up TM mid last year and have seen my life slowly but surely get richer in spiritual and emotional quality. This was a sign and gift from the universe, and I thank you for being its vehicle for me today! I have never heard of David Lynch… Am extremely passionate about women and girls and meditations to end the violence against them. This talk is driving my new project and I could not think of a better way to start a Monday. SO EXCITED. Many thanks and God bless you!! I love this! 8 years ago at the direction of my doctor I began meditation for 15 minutes each day. I was pregnant with baby #4 and really needed the “quiet time” as I called it. Imagine if you will a very big pregnant lady with a 5 yo, 3 yo and 1 yo–sitting silently for 15 minutes! Recently I have been working with kids at the school to help set up the beds for our homeless shelter–after we make the beds we stand at the foot of the bed and have one minute of silence to offer a blessing to those who will spend the night. Then I open it up to free flow prayer . . . it is miraculous! The parents often cry as the children share their hearts. I am actually in the process of pursuing a Ph.D is Conflict Resolution for this exact reason, to one day be a Peace Professor! I LOVE, LOVE, LOVE the idea of supporting a Peace University as Bob mentioned! As usual the Universe has delivered confirmation that my path is perfect, and I am exactly where I need to be. Thank you both for such an inspiring video. Caitlin, the David Lynch Foundation and the TM organization work with existing schools all over the world, trying to create large groups of people meditating for world peace. Father Gabriel Mejia of Colombia is a Roman Catholic priest who happens to be a TM teacher and runs a network of 60 orphanages in South America and has all 5,000 of his children learn TM. The President of Colombia happens to practice TM and when the government captures child rebels, they are sent to Father Gabriel for rehabilitation. All 700 staff and all the older children practice the TM-Sidhis in groups, as part of the world-wide group meditation project the TM organization has been working on for nearly 40 years. There are tens of thousands of students at various Indian reservations and private schools in Central and South America that are also part of that project. The tribes think that group meditation for world peace is an outstanding idea and are happy their kids are part of it. The goal is to have 50,000 students of all ages throughout South America practicing the TM-SIdhis daily within the next month or three so that no matter teh holiday schedule, there will always be at least the square-root of 1% of the world’s population gathered to meditate for peace (the idea being that if 1% of the world mediates regularly, it will help bring peace to the world, so if the square-root of that number can mediate together every day in a single group, it will have a synergistic effect equivalent to that larger number mediating at random during the day). FAB.U.LOUS video! I love TM, and this interview just sold me even more. My next goal… get my kids trained! Bob (and you, Gabby) are correct… meditation IS a major missing piece in bringing Peace to our world. I feel as you do – it literally saved my life back in 2007. I would not be here without it. Anyone who takes even a few minutes each day will feel more peace in their life… my number one recommendation to friends, family, and clients – meditate! I’m super intrigued by this and I’m going to find a teacher! I even emailed him about coming on my podcast to talk about spreading peace! woot! Thank you Gabby, I have been think that I would like to get back to a consistent daily meditation practice. I often struggle with which mantra that I should use. I was trained in TM and given my mantra some years ago when my chiropractor suggested I try meditation. Of course after he mentioned it, my teacher suddenly appeared it certainly helped turn my heath around back then! Easy of enough, I will just go back to my TM practice! I have been doing Kundalini Yoga (love it!) and I have been study A Course in Miracles with a group at my local church for almost a year now (We are on the last chapter! These last chapters are very meaty!) This book is making a profound difference in my life and will probably just start over with the lessons and begin the group again. Thank you for point me back to TM!!! Much love and gratitude to you. Thank you so much Gabby. Love you! This has been my FAVORITE video by far and I’ve been following your work for years. But why is it so expensive? It makes it seem really scammy to me since you have to spend $1,000+ just to learn this “secret” technique. Emily, I was taught TM by women that just appeared in my life after my Chiropractor suggested meditation for me. She just ask for donations. To me it doesn’t seem like there is anything special to learn that is any different then any other type of meditation using a mantra. She just explained things to me and gave me my mantra through a ceremony and watched me in meditation for a while. She referred to the thought coming in as little bubbles of stress leaving my body. TM is taught through a highly formal process by teachers who pledge to only teach meditation the way they were taught, and only through the organizations that the old monk set up. I don’t know that you were ripped off, but TM is taught over a period of 4 days and there’s paperwork you sign to register to be eligible for the free lifetime followup at any other TM center in teh USA. It’s a stupid legal hassle, but because everyone wants to learn TM, there are con-artists who pretend to be TM teachers and the TM organization has a copyright on the name so no-one can legally pretend to be a TM teacher. That doesn’t mean people don’t try, though. TM teachers charge a formal fee, and do NOT ask for donations, so that could be a sign that you learned from a pretend TM teacher or at least from someone who no longer maintains ties to the national and international organizations (TM teachers actually teach Presidents of major countries, and Bob Roth ends up teaching billionaires (“meditation teacher to teh stars” LOL), so they can’t be seen as being amateurs, so everything is real formal). The TM technique is taught by professional, certified teachers in a very systematic seven step program – http://www.tm.org/learn-tm. To make it widely available throughout the world, we need teachers everywhere and physical spaces to teach in. The course fees pay for all those expenses (they are more than most people realize!) A lifetime of followup support is included. It is worth every penny! Check out this interesting article written by Jim Karpen, PhD, M.U.M. where he points out the fundamental differences between TM and Mindfulness. “These two approaches to meditation come from different traditions, are practiced in a different manner, have different effects on the brain, and are different in the way they’re learned. Transcendental Meditation comes from the Vedic tradition and was introduced by Maharishi Mahesh Yogi. Mindfulness comes from the Buddhist tradition, and was popularized in the West by Jon Kabat-Zinn. Mindfulness meditation involves training one’s mind to be in the present moment. It typically involves passive attention to one’s breathing, sensations, and thoughts during meditation, sometimes referred to generically as open monitoring. In this regard, the main difference between the two is that the goal of mindfulness meditation is to have one’s thoughts be on the present moment, whereas with Transcendental Meditation, the goal is to transcend thought itself and experience a state of “pure awareness,” in which one is aware but without an object of thought. These differing approaches to meditation, and differing subjective experiences during meditation, are clearly reflected in the contrasting neurophysiological states associated with each practice. Transcendental Meditation has been found to activate the brain’s default mode network, which is a natural resting state of the brain. Mindfulness meditation deactivates the default mode network. In addition, the EEG signatures or brain wave patterns associated with each practice are also different. Transcendental Meditation is typified by alpha brain waves, and mindfulness meditation by theta brain waves. Alpha is associated with relaxation while theta is associated with a readiness to process incoming signals. Finally, the two approaches to meditation are learned in different ways. TM can only be learned from a certified teacher, who has been extensively trained and who teaches the technique in a very precise way. The teaching and the practice of the technique are standardized. With mindfulness, one can learn the technique in a variety of ways, and there are somewhat varied interpretations regarding how it should be practiced. A good way to learn is by taking the 8-week course on Mindfulness-Based Stress Reduction developed by Kabat-Zinn. But one can also learn mindfulness from various websites or books or magazine articles. The ultimate goals of each technique also differ. With TM, long-term practice can result in a state of cosmic consciousness, in which the experience of transcendence is always present in one’s awareness, even during activity. One comes to experience one’s self as universal and omnipresent. One’s identity shifts from the individual to the cosmic. With mindfulness, the ultimate goal is to always be in the present moment, with greater clarity and focus. Thank you, Gabby! I’ve always been very curious about TM, but it seemed a little outside my purview. Yet to listen to you and Bob talk about it in a very straightforward way deeply encourages me! I’m going to email him now. I’m also deeply struck by the idea that even when a small group of folks come together, it affects the entire community. I truly believe it, but didn’t think it was scientifically proven. Thank you for your work and moving this forward! Cheers to a beautiful 2015! I was feeling extremely lost and anxious today until I watched this vlog. I am truly excited to try TM and get back in touch with my ING. Thank you Gabby, thank you Bob for inspiring and educating me. Bob is so lovely! And so are you Gabby 🙂 Transcendental Meditation has been on my radar for a while… I think it’s time to take the leap. I loved what you were saying about being in the presence of someone that has dedicated their life to peace. This vid was such a joy to watch, so natural and lovely! Yay spirit junkies for life!! I resonate with you in so many ways and I love that you practice TM! I learned Nov 8th 2013! Group meditation is the best thing. I wish I could do it with my boyfriend. Sat Nam and thanks for sharing. I have been doing TM for just over 5 years . I’m also a kundalini Yoga Teacher and have been doing for the same amount of time. I have completely let my TM practice slip the last year ( using the excuse of having a toddler!!) this just reminds me I need to get back to my practice. I have so much to do with getting my business up and running TM is totally what I need back in my life !. Wahe Guru! Thank you Gabby for all spiritual work you do! I practiced TM twice daily some 10 years ago, but stopped. Started following “gospel of Gabby” 🙂 about a year ago and you made me remember my meditation practice. So wonderful to see this vlog about TM! Thank you for reminding me of the easiest way to bliss, abundance, presence, peace, health, happiness, confidence…I ever tried. TM. Dont forget that TM checking is free in the USA to anyone who ever learned TM officially. You can find your local TM center through http://www.tm.org and make an appointment to get checked. His own Catholic order plays the David Lynch Foundation documentary about him to villagers in Africa in order to inspire them: https://www.youtube.com/watch?v=A4sS3tHvQRQ even though he mentions meditation and yoga. As for the expense? It’s a lifetime membership fee good for receiving meditation help from any TM teacher anywhere in the USA for free, no matter when you learned, where you learned or how much you paid. TM has given me numerous gifts. Creativity, peace, clarity, calm heart, better personal relationships, and countless more benefits. I too would be interested in supporting the University for Peace project. Luminary Life Center is on a mission to bring peace to humanity. Let me know how I can support. Any suggestions on how to get TM into public schools (particularly elementary)? I feel this would be such an amazing tool to give to children at such a young age. We live in a small town in Montana and don’t have many resources so I am wondering where would be best to begin to give these tools to our children. Gabby and Bob I cannot thank you enough for sharing this powerful message. This was one of my favorite videos. I was smiling on the inside the whole time. Both of your words are so powerful and are making a difference in my life and so many others everyday. I love the idea of Universities of Peace and I want to be a part of it. I have been guided lately to the idea of spreading peace and love through your teachings and meditation to kids all the way up to young adults. It is such an important age when many of us are trying to find ourselves and I am so thankful I have been brought to you over the past year. I wish for others though that they can find you at an even younger age when they are trying to decide what college to go to or career path to choose. It’s such a stressful time and if they could see what wonderful things could manifest in their life with the teachings of peace, love and miracles it would be a beautiful thing. I cannot wait to see what comes of it all! Thank you both from the bottom my heart and I am going to keep searching in myself to find where I am being guided to be. I started practicing TM at the recommendation of my cardiologist (a year & a half ago)…after we couldn’t find any clear, physical reason for my heart palpitations AND around the same time my little brother was tragically killed. I’ve been dealing with so much emotionally (in addition to losing my brother, one of my best friends also passed away quickly as well as two cousins..all suddenly & in the last year), that I’m probably not present to all of the benefits I’m receiving from TM yet, but I can say for 200% certainty that practicing TM has, for sure, kept me off of anti-depressants & anti-anxiety medication. Now that I’m learning to live with my grief & have accepted my journey, I’m enjoying the peace & rest that TM provides every day. I have emailed Bob at bob@ davidlynchfoundation.org but it bounced back. Is this the right email address? Besides purchasing the book on Transcendence, are there other resources you could share on how to get started in transcendental meditation? Happy Holidays and good new year to you, Ms. Bernstein. Gabby I am such a huge fan of your work and was browsing your blog when I came across this video. I was so excited and wanted to learn more. I visited the website and soon learned of the cost of the course and was discouraged. Did you go through the course yourself? Do you feel it is necessary for someone to practice TM? That cost is the maximum cost. It is meant to entice the wealthy to learn as they set the trends and fashions of Society and “the rich don’t shop at poor stores” to quote Maharishi Mahesh Yogi explaining why he had his organization raise the price of TM so much. It seems to have worked, Russell Simons, all by himself, donated enough money to the David Lynch Foundation so that 100,000 school children in the USA learned TM for free. Dilma Rousseff, President of Brazil, is a TMer, and her government recently announced plans to have 48,000 TM teachers trained–one for each public school–so that all 45 million school kids in Brazil could learn TM for free. Getting the rich and influential interested can open doors that normally seem welded shut. And for people who can’t afford the price meant to entice hedge fund managers to learn, there are scholarships and grants available to learn through your local TM center. I originally made this list for prison inmates. I teach inmates how to transcend. They love it and are benefitting tremendously from it. After 16 weeks of transcending criminal thinking, trauma symptoms, mood disturbances, and stress levels decrease very significantly and dramatically. Transcending twice a day for 20 minutes is powerful criminal rehabilitation. Everyone should track down a copy of Deepak Chopra’s autobiography, _Return of the Rishi_ and suddenly you’ll understand Deepak Chopra better. Spirit junkie, mother of 3 awesome people and a wife to the man I love. to appreciate your traveling to Beijing and also almost everywhere else in China you wish to visit. many of one currency is worth one of many other currency. This was an interesting post. Meditation really makes you calm and compassionate and you slowly experience the peace within even when there is lots o noise outside. I don’t know why people continue to do this. I decided to meditate and saw a blue light. I did this again the next night and it was a terrible spiritual experience. Please google alien / Bible. This is dangerous. You are selling your souls for a bit of pleasure. I felt wonderful after my 1st experience. IDK why the 2nd experience ended up the way it did except that I am a Born Again Christian. It’s not good, this is taking you away from God who wrote the Hebrew Bible. The only Real Bible. Please just google and get informed. Blessings Always! And Prayers for all on this site. Meditation can help people no matter what stage of life they are in.Even for people that are happy it can help you reach even farther. There is no limit. Wow Gabby,Thanks for the sharing video.nice!!! So many people noticed that after practicing meditation for a few days, their lives have changed they became more understanding, more compassionate and joyful! In this link http://bit.ly/1SEejVO, you’ll be able to see the benefits of meditation that can affect directly our life style. To do self improvement as well as in wellbeing care, meditation also plays an important role. For those who are looking to reduce weight, meditation can also help so open the http://bit.ly/1XR7OQR for further information! Meditation can reduce chronic pain and copes so much in chronic disease healing! Open the http://bit.ly/1MS6GMq for further details. Students are also invited to do this meditation, from http://bit.ly/1SEejVO as it helps in boosting mind and have stronger memory. Even if you meditate for only 10 min, you can get your inner peace back to you especially when you are stressed in the evening! I have already used this sound healing meditation type and it really worked for me, so if anyone is interested in it, open the http://bit.ly/1MS6GMq. I’m doing meditation for 1 month and it’s working really well, it’s a bit difficult, but it’s worth it. I recommend meditation to all people, including helping me sleep better. Amazing! It’s actually awesome piece of writing, I have got much clear idea regarding from this article. This was an interesting post. Meditation really makes you calm and compassionate and you slowly experience the peace within even when there is lots o noise outside. We need to have our kids adopt a regular meditation practice, and how instead of painstaking practices like detention, being in the present moment through meditation achieves more value for our kids (and us) in the long run. piece of writing, I have got much clear idea regarding from this article. This was an interesting post. Meditation really makes you calm and compassionate and you slowly experience the peace within even when there is lots o noise outside. Amazing! It’s truely fantastic piece of writing, I have were given tons clear concept regarding from this article. This become an thrilling post. Meditation truely makes you calm and compassionate and also you slowly experience the peace within even if there is a lot o noise outside. this article. This become an thrilling post. Meditation truely makes you calm and compassionate and also you slowly experience the peace within even if there is a lot o noise outside.